Using a mounting block makes saddling up easier for riders and prevents tugging on the back of the saddle, wrenching it around out of place and causing discomfort to the horse. 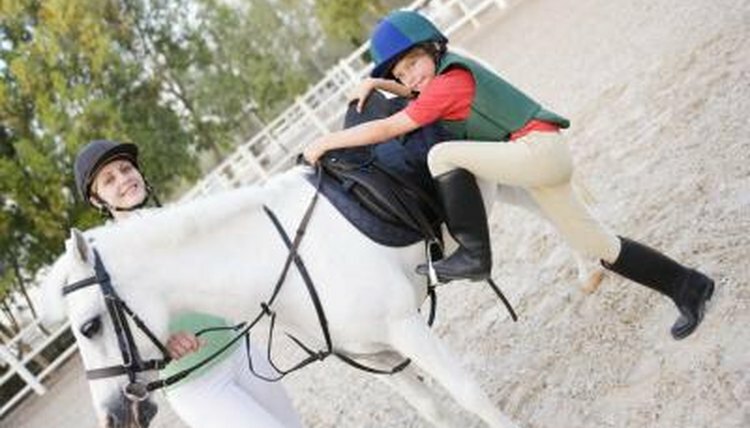 It is important for mounting blocks to be strong, stable and nonslippery. They are also useful for shorter riders to use to groom horses and braid their manes. You can make your own mounting block if you have basic handyman skills. Use the tape measure and pencil to mark each 12-foot length of lumber into two 3-foot lengths, a 2-foot length and a 4-foot length. Mark the 10-foot post into two 1-foot lengths and four 2-foot lengths. Put on the safety glasses and gloves, then cut the lumber into the lengths you have marked. Assemble the structure on a flat surface. It will take an area of 3 feet by 4 feet; on one end you'll build a step of 3 feet by 2 feet. Use all four 4-foot lengths and four of the 3-foot lengths to build the base 12 inches high. Use the 12-inch 4-by-4 posts at either end of one 3-foot length to screw the boards to, and use two of the longer 4-by-4 posts for the corners at the other end so you can screw more boards to those. Place a two-feet length of board on top of the 4-foot length starting at the tall post, to work out the location of the other tall 4-by-4 post on each side to frame the top step. Screw the remaining lengths of 2-foot and 3-foot boards to complete the top step. You now have an open structure 1 foot high at one end and 2 feet high at the other. Locate the structure where you want the mounting block to be. Fill it to the top with sand. The weight of the sand will anchor the structure. Sand is a stable surface for the rider to stand on for mounting that will not be slippery in wet weather.  Give careful consideration to where you want to locate the mounting block, as you'll set it up as essentially a permanent structure.  You can change the dimensions of the mounting block to suit your specific requirements.